The C125 Khukuri by Ed Schempp was introduced in 2008. The design is influenced by a commonly in Nepal used type of knife, the Khukuri, also spelled Kukri or Khukri (see e.g. here for more information about Khukuris in general). 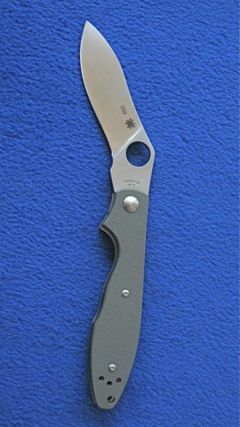 The C125 Khukuri first appeared in the 2009 Spyderco product catalog. Posting by "Ed Schempp" about grip positions and edge length. "Theories on when and where Khukuri blades originated are all over the board. Examples are so varied it’s probably accurate saying they might be the oldest cutlery style known. Today’s cutlery circles recognize it as the national knife of Nepal but we know similar blade shapes were found on Greek swords (or Kopis) 2500 years ago, on Macedonian cavalry swords, Mongolian knives, 4th century Indian cutting implements and even some Japanese swords have similarities to today’s modern Khukuri. In our world a Khukuri (also labeled a Khurkuri Gurkha or a Kukri) is used for a variety of everyday cutting chores and clearly associated with the country of Nepal. They’re commonly used in Nepalese households and carried by military personnel." "Spyderco’s folding Khukuri is an Ed Schempp design with a semi-traditionally shaped VG-10 steel curving blade and deep drop-point belly offering impressive full-flat ground cutting power. Historically, the curve is synonymous with the valor of the solider carrying it. Our stylized version has a tapered hilt laying the foundation for dexterous control over the generous-sized blade. The handle is foliage green G-10 with left/right-hand tip up carry pocket clip. Inside the G-10 are full-length internal liners and a Michael Walker LinerLock®." This page was last modified on 15 January 2011, at 19:52.